The Maya hieroglyph for ‘tail’ (pic 1) - also used as the phonetic syllable neh - is an obvious depiction of an actual jaguar’s tail; in fact it was the conventional sign for ANY animal’s tail (eg deer, monkey, armadillo, tortoise...), not just of a jaguar. In the same way the sign for (human) ‘bone’ came to represent any bone, whether human, animal or bird. Jaguars were powerful both in real-life and as symbols in Maya art, and so their pelts were particularly prized as costume accessories and in the clothing of royals and nobles. Jaguar skins were used to cover sacred and valuable objects such as screenfold (books), drums and offering bowls. Rulers sat on jaguar-shaped thrones, draped with jaguar skins, and Maya warriors can be seen dressed in jaguar skins (in the famous murals of Bonampak, for example), taking on the power of this ferocious creature of the rainforest. Weapons - from shields to spears - were adorned with long strips of jaguar pelt. More Maya kings included the word for jaguar in their names than that for any other animal. The jaguar was a sign of wealth, authority, a badge of honour... 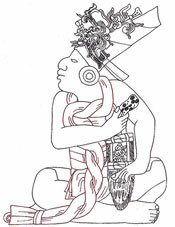 It features in the Maya glyph for way or spirit guide; its spotted pelt was believed to mirror the star-studded night sky... By painting a jaguar tail on an expensive cacao pot, then, the artist was not just depicting the handle of a valuable object, but making a statement too: ‘This is MY special cacao pot’! • Pic 2: image of an illustration by Andrea Stone scanned from our own copy of Reading Maya Art by Andrea Stone and Marc Zender, Thames & Hudson, London, 2011.